Phones have been big in the news lately, but it’s April, and that means it’s the start of the TV season, so what’s new from Samsung? It may not seem like it, but a year in consumer technology can easily follow trends. Major new technology announcements rock up in January, phones to follow mostly in February and March, and the period we’re in now — March to May — that’s for TVs and home theatre gear, at least for the first half of the year. You may not realise it, but that’s a pretty consistent timeline for companies, and this year is no different, as major electronics makers are showing what they’re bringing to Australia right now. 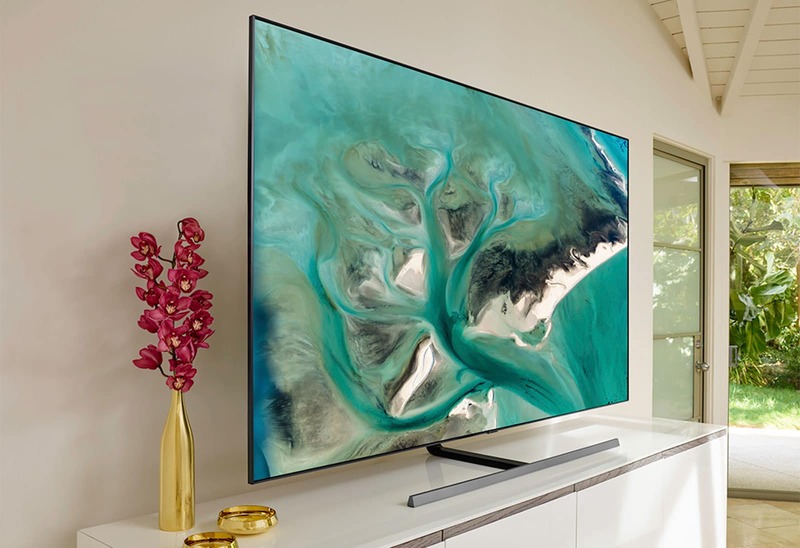 Samsung is one TV maker doing just that, and after revealing that it would be releasing Australia’s first publicly available 8K QLED TV, it has a line-up of 4K TVs coming, too. Truth be told, they’ll probably be bigger sellers than the 8K range, which has virtually no content available as of yet, and is basically geared at folks in the “early adopter” crowd. Meanwhile, the 4K QLED range Samsung is talking about could be for just about anyone, and given the amount of choices on offer, “anyone” seems to be the goal here. This year, there will be two main ranges, with the quantum dot-based QLED range reliant on a self-explanatory technology called “Ultra Bright”, as well as support for the high-dynamic range of HDR10+ and the metal-coated quantum dot tech found in last year’s generation of TVs. Depending on the model you buy, the 2019 Samsung QLED TV could arrive with something new, such as working Samsung’s Direct Full Array Elite LED backlighting technology to control blacks to result in better picture quality, as well as a new “Anti-Glare” technology to prevent the sun from getting in the way, and a “Wide Viewing Angle” panel layer that allows people watching TVs at the extreme angles on the side to get a better picture experience altogether. You’ll find those technologies on Samsung’s Q80 and above, with the Direct Full Array Elite found on the Q75, as well. Sizes on these models appear to start around the 55 inch mark — what is considered the new “normal” — stretching up to 82 inches, which is the new 2019 high-end for TV sizes. 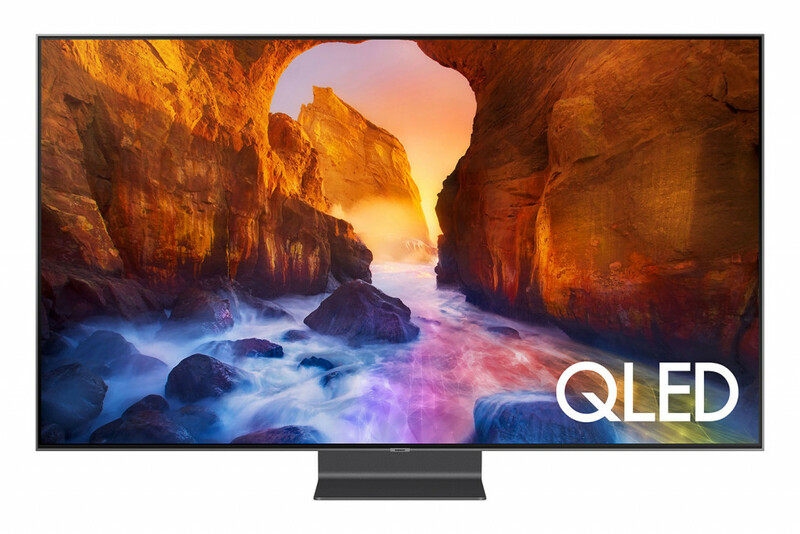 The entry-level QLED Samsung Q60 won’t get the new backlighting technology or the anti-glare technologies, but will start the quantum dot technology off with a price of $2299 for the 55 inch model, stretching all the way to $6999 for 82 inches, while the Q75 hits start on the premium technologies from $2899 for 55 inches, with the Q80 starting at $3899, the Q90 at $6499 for a 65 inch minimum size, and of course, there’s the 8K-capable model in the Q900, which starts at $9999 for the 65 inch TV. While that Q60 entry-point for QLED may seem a little down on its technology, it will see the ambient mode from last year’s QLED TVs, alongside every other QLED model this year, and now it can be customised to match furniture, making a TV work as wallpaper to blend in with the rest of the home, while an light sensor will match the brightness coming if you have a need to reduce your power consumption. Samsung won’t just be doing QLED TVs, either. 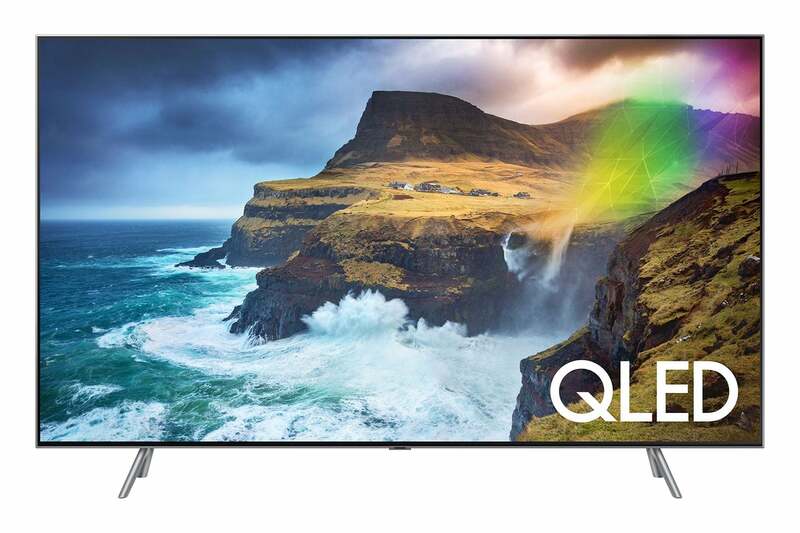 While the premium end of its TV market has the metal-coated quantum dots in mind, the entry level 4K screens can be found in the RU7100 and RU8000, the former of which starts at $899 for 43 inches, $1499 for 55 inches, $1999 for 65 inches, and $3099 for 75 inches, while the slightly more premium RU8000 will see a starting price of $1899 for 55 inches, $2699 for 65 inches, and $5499 for 82 inches. Alongside these new TVs, there are also matching soundbars, as Samsung offers models from $349 all the way to $1999, including technology — and a badge — from Harman/Kardon, now that Samsung owns that company. As such, the Q-series of Samsung Soundbars should see Dolby Atmos support from $799, leveraging Samsung’s “Acoustic Beam” technology to fire 3D sound into a room from the one soundbar, while Amazon’s Alexa support is also thrown in. The entire range — TVs and soundbars — is slated to hit stores very soon, landing at retailers from this month.